Many people seek meaning all their lives. Who are we, people ask, and why are we here. I won’t say I understand it all fully, of course, but from the time I was eleven years old, I’ve known I’m here to tell stories, and I’ve known those stories must be exciting. I remember reading Stephen King’s Needful Things; before then, I’d read the Hardy Boys and A Wrinkle in Time, Choose-Your-Own-Adventure Novels and whatever superhero comic books I could get my hands on (I wanted to fly, like Superman, but identified way more with Spiderman and the X-Men. The ones who were different, and knew it, but felt responsibility to the world). Before I read Needful Things, books were just words on paper, images I created in my head. Sure, they were fun, and I loved reading, but not a single one caused me to experience so singular a moment of transcendence as Stephen King (aided and abetted, as he was, by Alan Pangborn and Leland Gaunt). The climax of that book was a moment I’ll never, ever forget, and partly because I knew I wanted to create moments like that for others. It’s never been enough for me to write adequate, competent books. Which is good, because for many years, I never did. For many years, I wrote and rewrote bad Dean Koontz rip-offs. I want my books to change the world. Not the one out there, but this one, here. I want people to read my books, and afterwards for their lives to have changed, however slightly. I don’t want people to set aside my books and stories like literary detritus, enjoyed but then forgotten when everyday life resumes; I want my stories to cling to people by heart-barbs and brain-catches. I want people to chat with their friends and to start relaying a story that happened to a friend-of-a-friend only to realize, mid-anecdote, that really, they don’t know anyone who had that experience but rather read about it in one of my stories. That is what I aspire to when I come to a keyboard. One word after another, each one leading toward some moment of revelation, epiphany, and transcendence. One word after another until one world changes the perspective of whomever reads it, so deeply is it felt. To that end: Exciting Books. Books and stories that change your world. It’s so easy to settle for adequate, competent books. There are so many adequate, competent books out there. There are so many books that get the job done, provide mere escapes, momentary distraction from the routine and mundane. Those are not what Exciting Books aim to be. Exciting Books aims to be the choice for discerning readers who want extraordinary literary experiences. Exciting Books are meant for readers who don’t want another vampire, another zombie, another mash-up, another spy; Exciting Books are meant for readers who want to read better than incompetent pundits, stoned actors, bedwetters, and sparkly vampires. For now, Exciting Books is concentrated on the Kindle platform. Why? 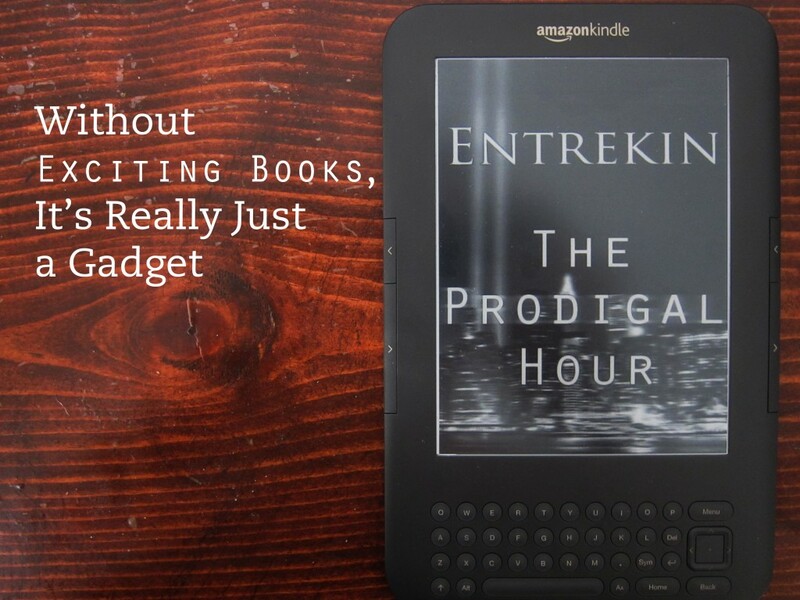 Because Amazon’s latest Kindle is the most exciting thing to happen to reading since an eleven-year-old boy finished Needful Things and realized he was a writer. Apple’s iPad and Barnes & Noble’s nook color don’t compete, for two reasons. The first is their LCD displays, which are great for just about everything except long-form reading; the second is that both devices can run Kindle apps, which makes the need for Apple’s iBookstore or Nook’s Bookstore exceedingly small (also, they use ePUB, which isn’t nearly as simple or intuitive to create/design/manipulate as Amazon’s format, which is based on the Mobipocket platform and basically comes down to html). By making something available via Kindle, one is effectively making it available on every smartphone/tablet/computing platform in existence. 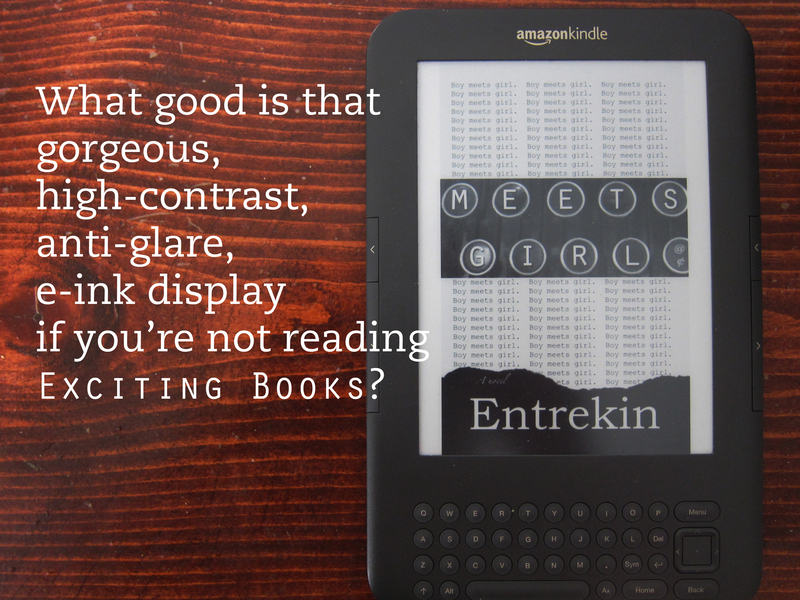 What good is that glorious, high-contrast, anti-glare, e-ink display if you’re not reading Exciting Books? Pitch: Exciting Books is an independent publisher of high quality, extraordinary, digital literary experiences for discerning readers. It’s not about either elitism or snobbery; it’s about good books written well and easily distinguishable from those offered by corporate publishers who favor books by reality-show stars, political pundits, and screen personalities. Exciting Books are available across all digital platforms, and perfect for laptops, tablets, e-readers, and smartphones.